If you have information to share, please leave comments (names, corrections, suggestions, etc.) in the comment box at the bottom of the page for each topic. Thanks. On January 27, 1967, a cabin fire during a launch rehearsal test at Cape Canaveral Air Force Station Launch Complex 34 killed all three crew members of the planned first Apollo mission—Command Pilot Virgil I. “Gus” Grissom, Senior Pilot Edward H. White II, and Pilot Roger B. Chaffee. The ground crew tried futilely to rescue the crew while risking their own lives. 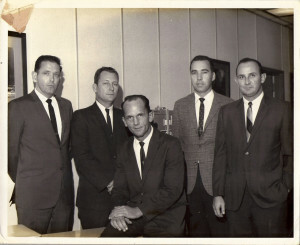 Five men of the ground crew who received the NASA Medal for Exceptional Bravery on Oct 23, 1967 are shown in the photo. A Florida Today article is shown below with the photo. 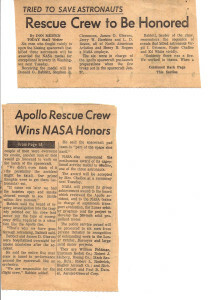 Not shown is Henry H. Rogers Jr. of NASA, a sixth team member who also received the award. Click on the photo icons to open and enlarge. 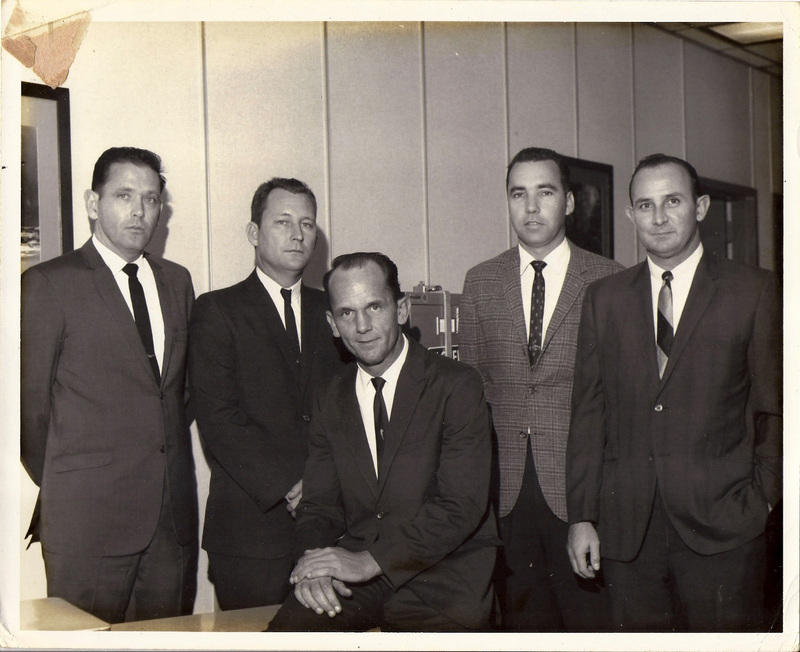 From left, James D. Gleaves, L. D. Reece, Jerry W. Hawkins, Stephen B. Clemmons, and Donald O. Babbit, all of North American Aviation Space Division. 4, 5, 6, are JSC suit Technicians, one assigned to each astronaut. Second from left is my uncle LD. 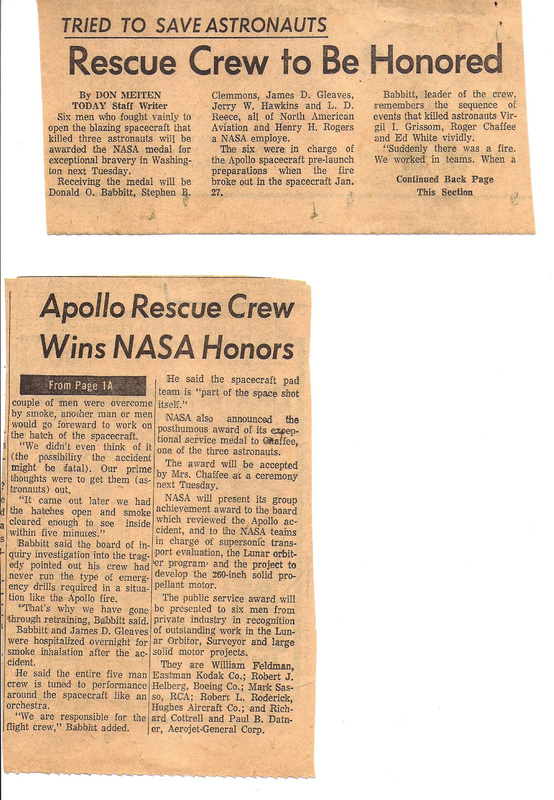 Thank you for the names and photo of the Apollo 1 technicians. Could not find it anywhere else. Could we please have your permission? Thank you. Yes, by all means. Approval to use the photo for the Air & Space/Smithsonian Magazine is granted.